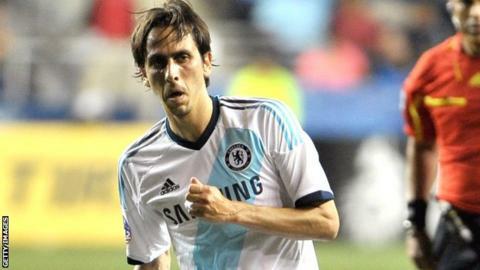 West Ham have agreed a deal to sign Israel midfielder Yossi Benayoun on a season-long loan from Chelsea. The clubs finally reached a compromise at around 22:00 BST after several hours of negotiations over how Benayoun's salary would be paid. The 32-year-old must now complete the relevant paperwork before the 23:00 BST deadline for the deal to go through. Benayoun returns to the club where in 2005 he began his career in English football, making 72 appearances. He joined Liverpool for £5m in 2007 before moving to Chelsea for a similar price three years later. Benayoun spent last season on loan at Arsenal, scoring six goals in 26 matches for the Gunners. He returned to Chelsea in the summer but was informed he could leave Stamford Bridge if a suitable bid arrived. With no permanent offers to the Blues' or Benayoun's liking, a free loan was the only option before the transfer window closed. There were enquiries from a number of Premier League clubs, but the Israeli favoured a return to Upton Park. After struggling to agree on the percentage of his wages they would both pay, the clubs eventually found common ground. Meanwhile, Chelsea have sent winger Gael Kakuta on a season-long loan to Dutch side Vitesse Arnhem. The 21-year-old, whose contract runs until 2015, has been unable to establish himself since signing from Lens in 2007. Kakuta spent time on loan with Fulham and Bolton before returning to France with Dijon in the latter part of last season.